Manning played two series and hit 4 of 7 passes for 26 yards. 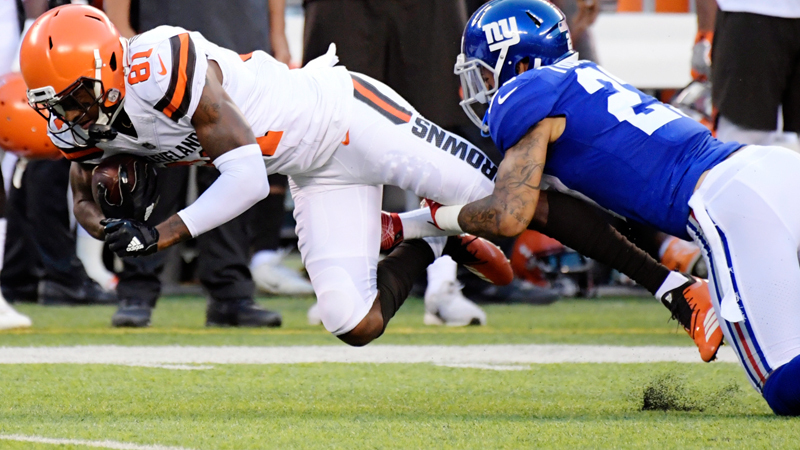 Receiver Odell Beckham Jr., returning from major ankle surgery, dressed but was held out by Pat Shurmur, who is trying to rebuild the Giants after a 3-13 season. The troubled fourth-round pick played despite being cited for marijuana possession and driving with a suspended license. Police also found bullets and a gun part in his car this week. He had three catches for 87 yards, including a diving 24-yarder that the Browns successfully challenged after it was ruled incomplete on the field. The Browns have had interest in free agent receiver Dez Bryant, and the former Cowboy tweeted during the game he was coming to visit GM John Dorsey. The Browns may not need him. Free agent signee Jarvis Landry had two catches for 36 yards in very limited action. Callaway added 87 yards and third-year pro Rashard Higgins looked good with four receptions for 66 yards.